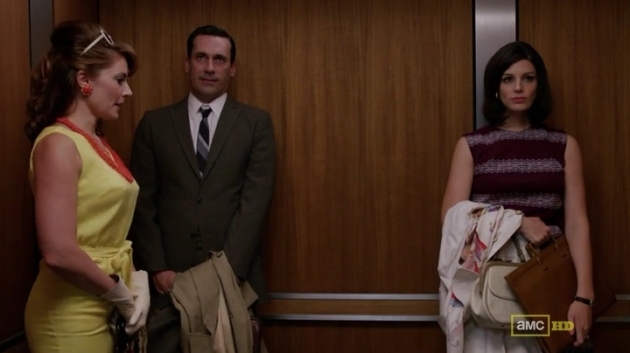 STAR TREK Meets… MAD MEN? Turns out there’s a great nostalgia-oriented website called The Retroist that curates some of the coolest stuff from/about bygone ages (like the 1980s or 1960s), and these fine folks have uncovered a mind-bending mashup of cool, courtesy of artist Matt Wiley, who has reimagined the classic STAR TREK series as vintage advertising. You gotta love the non-plussed look on the yeoman’s face as Captain Kirk hits on her in the turbolift. Don Draper would be proud (of the design and mack daddy Kirk)! Thanks to @TedOnTV for the heads-up via Twitter. What scares — correction, scared — ultimate ladies’ man Don Draper? Would you believe a woman? You would once you found out the woman was Joan! The notorious man-eater had Don quaking in his boots during the first week he worked at Sterling Cooper. 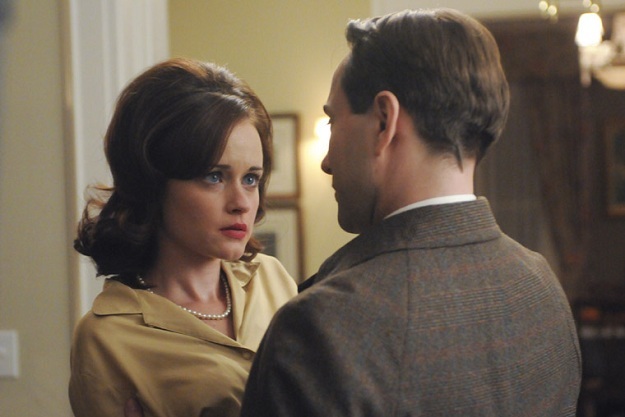 That’s just one of the interesting details we learned from this week’s MAD MEN. Another fact is that Lane is in even deeper financial trouble than we were led to believe. And he’s only digging himself in deeper. Faced with an overdue tax bill that was due in two days, Lane (Jared Harris) did the only thing he could think of: He defrauded Sterling Cooper Draper Pryce for the dough. He went out and borrowed $50,000 for the firm, then pretended it was a company surplus and called for Christmas bonuses all around. When Don (Jon Hamm) suggested delaying the checks until the Xmas party, Lane turned to forgery to cut himself a check immediately. “My name is Megan Draper, and I’m an actingoholic.” Well, Megan’s reveal wasn’t quite as dramatic as all that, but viewers did get another peek into her creative soul — even as we also peered deep into the dark abyss where Pete’s conscience used to be. I’m always intrigued by the subject matter of the episodes that MAD MEN creator Matt Weiner decides to write himself. I like to imagine they are particularly important; the kind of stories Weiner doesn’t want to trust to anyone else. And I think this week’s events fell into that category; the characterizations were strong, even if the plots were lightweight. Viewers got to see the demons that drove Megan and Pete to lie to their spouses and embark on secret lives. The Draper women edged into the spotlight a little more this week. 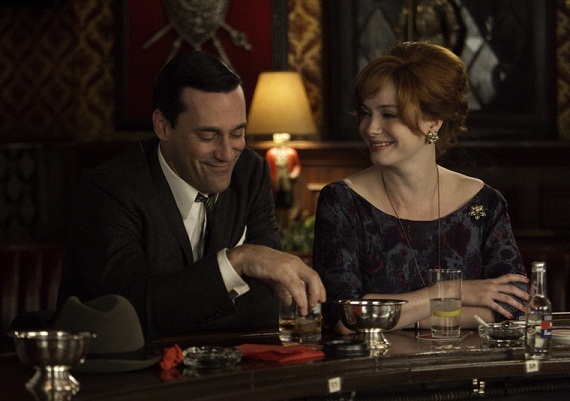 This is nothing new for Megan, who has been a lodestone for storylines this season as MAD MEN explores Don’s new marriage. But Sally is also continuing her growth as a character. You will recall several… er, strange incidents last season; I’m expecting a payoff on that material this season. Apparently as bored by the Heinz beans account as the viewing audience, Megan (Jessica Paré) came up with a brilliant campaign — mothers serving beans since the dawn of time and on into the future! — which Don (Jon Hamm) loved. 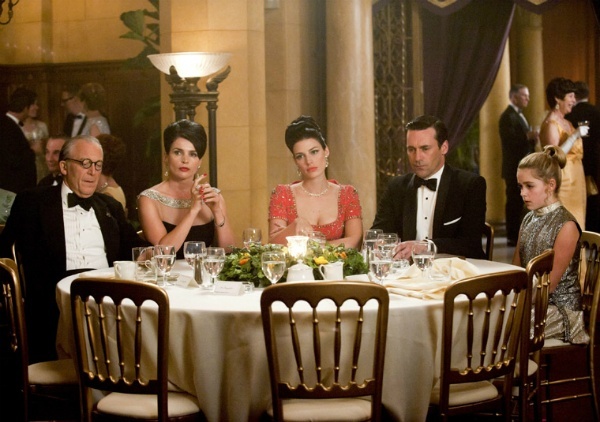 That night, at a casual dinner with Heinz honcho Raymond, his wife let slip to Megan that Sterling Cooper Draper Price were being fired. Megan passed the news to Don in a whisper and set him up to deliver the beans pitch on the spot — “Heinz beans: Some things never change” — which he did with all the charm of first-season Don. Raymond was instantly sold and the account was saved! 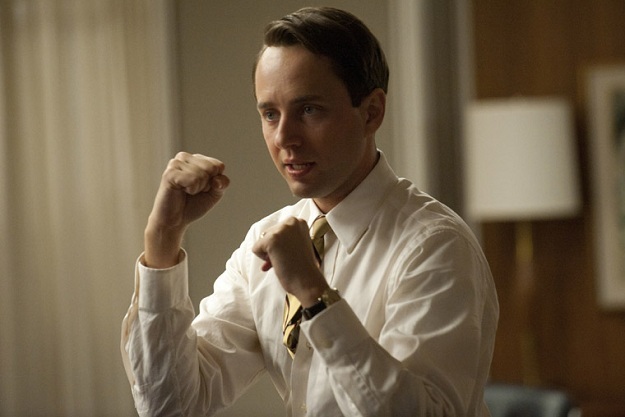 Pete Campbell and his portrayer, Vincent Kartheiser, got a genuine spotlight episode this week, and it illuminated just how dark Pete’s life has gotten lately. He seems to have it all: a great job, a pregnant wife and a home in the ritzy suburbs. But in Pete’s mind, none of it holds water. The faucet in the kitchen is leaking, and Pete can’t sleep. The relentless drip, drip, drip of the water leaking away is clearly gnawing at his mind. It parallels his feeling that his life is being wasted and he is wasting away, drip by drip, living in the wilderness of the suburbs and laboring unappreciated at the office. Nothing is working out the way he imagined it, and his life is eroding, drop by drop… The monotonous sound is washing away everything he ever dreamed for his life. This episode was more of a return to form after last week, but it still took a while to get off the ground. It occurs to me that perhaps the problem is that this season’s episodes are featuring too many storylines that are too divorced from each other, making the episodes feel very choppy and… er, episodic. There needs to be more connection between all the disparate story elements; the threads need to entwine in a more substantial way than Sally calling her father to complain about her subplot… er, problems.